Before you read this, please know I’m making fun of myself! Feel free to laugh at me or with me, but don’t think for a second that I’m making light of singles or that all married women are as helpless as me! Just enjoy this for what it is…good-natured humor! On Sunday, I realized that singles are superheroes. If you don’t believe me now, you will soon. Everyone likes to say how hard marriage is and how much you have to work for it and blah, blah, blah. For instance, my husband and I were on our way home from church and we had a couple of errands to run. We live outside of town and we are homebodies, so after church is the best time to do all the shopping. We decided that he would go to Home Depot while I went to Smart and Final, which by the way is not our favorite place to shop, but we only needed a few things and it was close to Home Depot. I debated over grapes and bananas and looked at coffee and confidently put tangerines in my cart. I don’t even go 10 minutes before I call my husband. I proceed to the checkout, pay, bag our pitiful amount of groceries, walk outside the store, double bag my groceries, stop to put the money in my wallet and continue on to the next stop which is FOOD. We agree that I will order some food and then wait for him here. I go through the line, while holding my heavy bag of groceries, my purse, and my money. I pay for my food, and ask the nice woman for a water cup. By now, I’m holding my heavy bag of groceries, my small purse, my receipt, the change, and my cup for water. I get lots of ice before I realize that I can’t push the lever for water and hold my cup beneath it, because my hand just isn’t that amazing and my arms are full of everything else. I content myself with ice. I find a nice out of the way seat and corral all of my belongings. But then I realize that when my order is ready, I will have to gather up all this stuff and take it with me. I have no husband to watch it! I’m on my own! And I need to go to the bathroom, but that’s out of the question because I can barely function as it is. I decide that it’s in everyone’s best interest if I move closer to the register and so I do. I tote all my stuff, plus my sorry cup of ice, which ends up spilling on the floor in the process of changing tables. I have left an ice trail, but I sit down anyway. Conscience doesn’t let me leave the obvious line of ice, so I quickly leave the table (while my stuff still sits there which I was trying to avoid in the first place) and pick up the ice. Finally, I am able to sit down, and I realize just how pathetic I’ve become! I am essentially helpless on my own. It’s so much easier with 2 people, because together we have 4 arms and 4 legs, and quadruple the intelligence ( and in my case, the loving husband makes up most of that). After getting my food, I miss a call while I realize that my husband is waiting for me in the truck. I have just about had it with all of this, but have now added a take-out bag of food to the mix! Surprisingly, my skill has vastly improved since the start of the errand, and I even manage to add water to my ice. It is my one success! I labor my way to the truck; get in, pathetically ask my husband to PLEASE take a bag. But an issue remains, because I still need to go to the bathroom. If I was a superhero, I could have managed this in the restaurant. I would have found a way to do it alone. I was a superhero once, but that was almost two years ago, and today I found myself unable to carry all my stuff, be the ears for my order, and successfully relive myself alone! Instead, I uncomfortably sit in the truck while simultaneously relieved that I am reunited with my other half and not carrying a bunch of junk everywhere. 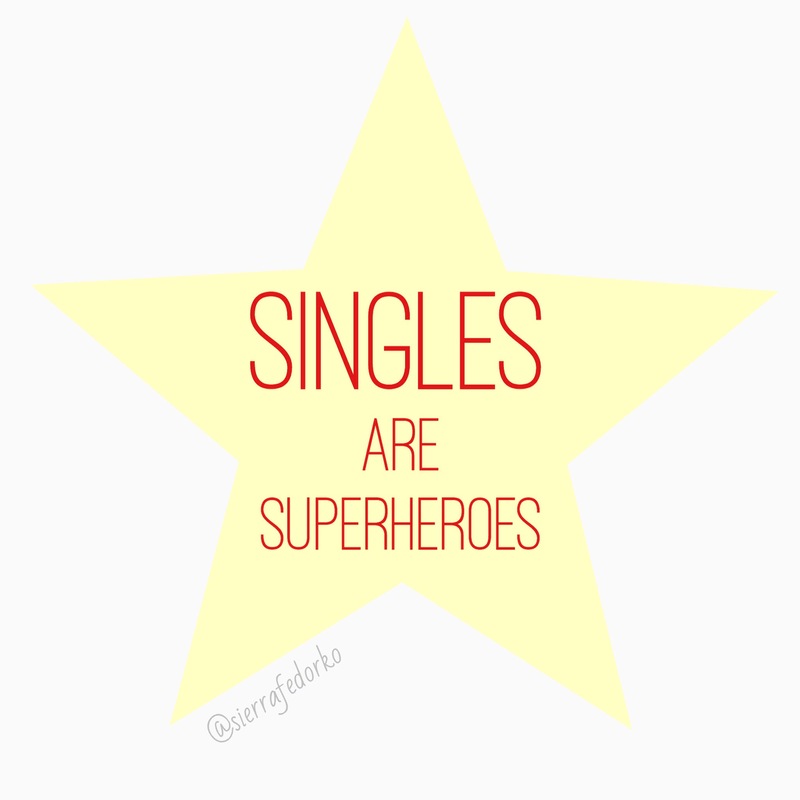 Here, I realize that singles are heroes. In fact, they are superheroes! They could have bought groceries, ordered food, waited for the food, gone to the bathroom, poured the water, and not have dropped any ice…because they are just THAT AWESOME (seriously though). And then, there’s me…. all worn out from my great expedition that didn’t even last a full hour. Let’s not even talk about the superpowers Moms possess! Oh, how I pale in comparison. In the meantime, I’ll just drink the water I successfully procured from the soda machine. But as I take a sip, I taste lemonade. I’m back to square 1. I was hoping it would have that effect! 🙂 I’m so glad it did, Rose!